The 3 cm shell case is made of steel. They come in two colours, brown and green. The firing cap is electrically ignited and the flash channels come in two forms; two small 1.8 mm diameter holes 3 mm apart over the centreline or one 2,5 mm hole in the centreline. The powder charge normaly consists of 30 grams Np rifle powder or 29,5 grams nitrocellulose blade (black ???) powder. The drawings are based on existing shells, measured with a calliper. All have the basic dimensions of 30 x 91 mm. Initial speed (Vo) is 500 m/s. In the list below, the various types of shells are indentified by a type (which is not of German origin), then the full German name, and followed by the abreviated German name as used in documents. For non-German readers trying to decipher the names, 'Übung' means training or practice, 'ohne Zerleger' means without self-destruct fuze. Tar-filled practice mine shell, made of a pressed and rolled steel body with a zinc nose piece to replace the fuze. The driving band is made of red copper and on the inside of the body is an aluminium support ring at the same height as the driving band. Note typical Mineshell round bottom that ensures an maximum explosive charge if used in HE role. Tar-filled practice mineshell, made of a pressed and rolled steel body with an steel dummy fuze resembling the AZ1504 as found on 20 mm shells. 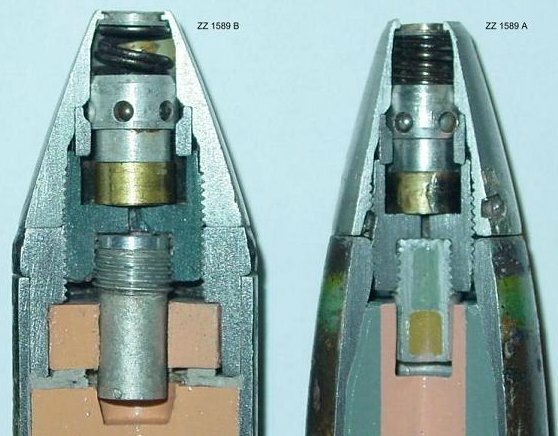 The body of the shell is the same as type A, except for the fact that the upper part of the body is rolled smaller to receive the smaller 20 mm shell fuzes. This shell is probably an experiment, these shells have never been seen with a AZ 1504. Practice shell. Machined steel body, pressed steel windshield. Note the different driving band design. Note the small additional powder charge in the shellcase, consisting of finer powder than the main charge. Remains of the bag are found in some shellcases. Practice armour piercing high explosive tracer shell with dummy fuze. Shellbody and dummy fuze are made of steel. The driving band is made of copper. The shell has the same flight characteristics as the live shell but has no explosive content. Weight of the shell is 500 +/- 7 grams. Dummy fuze: 3 cm Bd. Zerleger Erzatzstuck 1592. Practice high speed armour piercing shell with tracer. Shell body and dummy fuze are made of steel, the driving band is made of copper. Weight of the shell is 356 +/- 8 grams. Practice high explosive shell, machined steel body and bottom plug, copper driving band. The shell has no explosive contents. Tar-filled practice mineshell with an unbalance stick for short range. Pressed and rolled steel body with an steel dummy fuze and an steel unbalance stick. The unbalance stick is bent outward on the top causing the shell to fall into unbalance shortly after leaving the barrel and thereby greatly reducing the range of the shell. Weight of shell: appr. 330 +/- 8 grams. Shell probably of experimental design. Tar-filled practice mineshell type A. Pressed and rolled steel body with a steel dummy fuze. The driving band is made of red copper and on the inside of the shell is an aluminium ring to support the driving band. The weight of the shell is 330 +/- 8 grams. Mineshell fuzed with ZZ1589B. Pressed and rolled steel body and an aluminium fuze. Coloured yellow with a 5 mm light green band just under the fuze (meaning self-destruct shell). The shell is filled with 85 grams of HA41 (hexogen aluminium) or 85 grams of penthrite. Weight of shell: 330 +/- 8 grams. Mineshell with an incendiary element, fuzed with ZZ1589B. In fact it is the same shell as type I, except for the lower portion of the explosive charge that has been replaced with an incendiary element. It exists of a steel bushing, filled with electrontermit (thermite), ignited by the exploding shell. Thermite burns at a temperature of about 1200 degrees Celsius. Colour: yellow body with a 5 mm wide green and a 5 mm wide blue band under the fuze, green meaning self-destruct and the blue meaning incendiary. Weight of the shell: 370 +/- 8 grams. Mineshell fuzed with a non-delay AZ1587. Pressed and rolled steel body with an steel fuze adapter between body and steel fuze. The driving band is made of copper and on the inside of the shell is an aluminium ring to support the driving band. The shell is colored yellow overall, including fuze, and only has the letter M stamped on it, in black. The shell is filled with 85 gram HA41. Weight of shell: 330 +/- 8 grams. Incendiary mineshell fuzed with AZ1587. Pressed and rolled steel body with a steel fuze adapter and an aluminium fuze. The entire shell is filled with a pressed thermite charge, which spews fire like a roman candle after ignition. Thermite burns at a temperature of about 1200 degrees Celsius. The shell is coulored light blue overall, exept for the aluminium fuze. Weight of shell : 330 +/- 8 grams. Incendiary mineshell fuzed with AZ1587. Pressed and rolled steel body with a steel fuze adapter and an aluminium fuze. The entire shell is filled with an thermite charge, which spews fire like a roman candle after ignition. Thermite burns at a temperature of about 1200 degrees Celsius. The main difference with shell type L is that the shell has a cast thermite load instead of a pressed charge. It also has a steel cylinder in the bottom that functions like a centrifugal weight to balance the shell. The shell is colored light blue overall, exept for the aluminium fuze. Weight of shell: 330 +/- 8 grams. Mineshell with tracer, fuzed with ZZ1589 B. After firing the tracer ignites, allowing the pilot to observe the flight path of the shell. Day and night versions were available, the latter to prevent the pilot (who had his eyes adjusted to night) being blinded by the fiercer day tracers. The shell is coloured yellow overall, with a 5 mm wide green band just under the fuze, meaning self destruct. Just above the driving band is a light or dark red 5 mm wide band, the light red meaning (fierce burning) daytracer, dark red meaning (low visibility) night tracer. Explosive charge exists of 73 grams HA41 and 3 grams of nitropenta (pink core under the fuze). Weight of the shell : 330 +/- 8 grams. Due to the riffling of the barrel, the shell is given a high rotational speed during firing. This leads to centrifugal forces that push the six balls (7) outwards, forcing them in the collar ring and keeping the firing pin housing (4) which holds the firing pin (5) in upper position. Meanwhile the wrapped safety coil (6) rolls out, thereby opening the way for the firing pin housing to move downward forced by spring (8), however held back by the balls in the groove. At impact the firing pin housing with firing pin is simply hammered down in the duplex detonator (the balls are forced back into the firing pin housing), exploding the shell. If the rotational speed decreases too much (long time of flight, i.e. the shell missed target) the force of the spring will force the balls back into the firing pin housing after which it moves down due to the spring force. 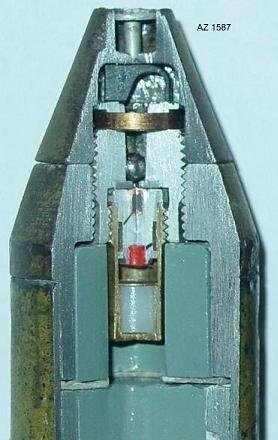 This forces the firing pin into the duplex detonator (10), exploding the shell. This description also applies to the ZZ 1589 A fuse. While at rest, the centrifugal safety pins (5) prevent the firing pin housing (3) holding the firing pin (4) from moving over the hole in the safety plate (9). They are held in this position by the the safety coil (6). During firing, the shell starts to rotate due to the riffling, making the centrifugal safety pins move outwards, overpowering the safety coil, allowing the firing pin housing (3) to move to its central position. Immediately after firing the shell starts to loose speed due to aerodynamic drag. This deceleration makes the ball (7) move forward inside the the adapter body (2). As soon as the ball has reached the top position, it will fall in a recess in the firing pin housing, thereby making the housing heavier on the side of the ball. Centrifugal force will now swing the ball outward , thereby pulling the firing pin housing in its central position, with the firing pin over the hole in the safety plate. At impact the firing pin is hammered into the Duplex detonator, thereby exploding the shell. 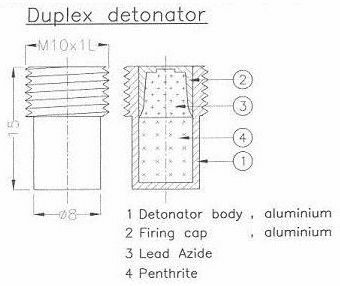 The duplex detonator consists of a detonator body (1) with a firing cap (2), filled with lead azide at the top and penthrite at the bottom. It is ignited by the firing pin of the fuze being pushed in. It can be found in shells from 15 up to 88 mm, but it is most commonly used in shells up to 50mm. 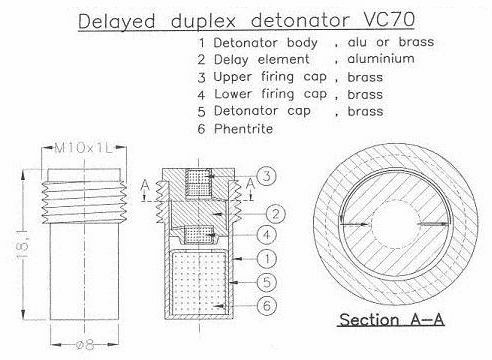 The VC 70 delayed duplex detonator delays the exploding of the shell for about 10 cm of flight, so the shell explodes after passing the aircraft skin, inside the aircraft. After the firing pin has hit the firing cap (3) the flame travels through a small hole outward into a circular chamber on the outside of the delay element (2). From there the flame travels half round the circular chamber where it follows a hole leading to the lower firing cap (4). The lower firing cap will ignite the penthrite charge, exploding the shell.